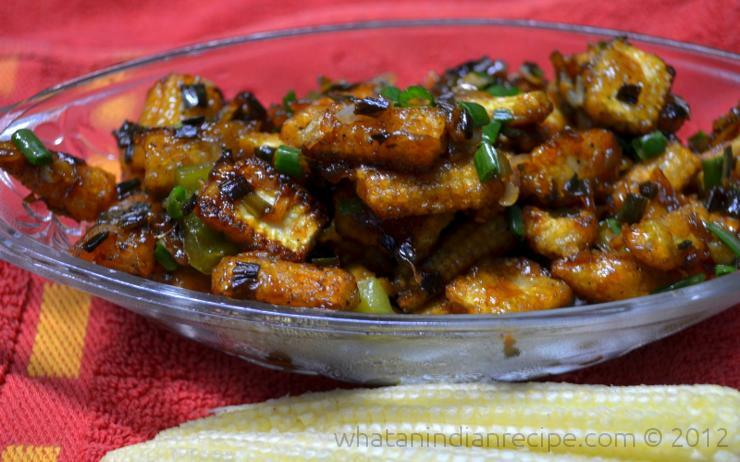 Crispy Chilli Baby corn is a favourite appetizer, especially for the vegetarians. Easy to prepare, and healthy too.Makes a great snack for kids too, nutritious, crunchy and tasty for them. Mix cornflour, salt,pepper and ginger paste in a bowl.Marinate the baby corn pieces in it so that it is coated well. Heat oil in a pan/kadhai and then fry the baby corn pieces till golden brown and crispy and keep aside. Heat 2 tbsp oil in a pan/kadhai and add onions, ginger and green chillies, sautÃ© for a minute. Now add the capsicum and spring onions and again sautÃ© for 1 minute. Add green chilli sauce, vinegar, soya sauce and tomato sauce and mix well. Now toss the fried baby corn pieces in this sauce , garnish with more spring onions and serve hot.